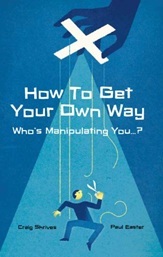 How To Get Your Own Way: Who's Manipulating You? We live in a competitive world. Getting ahead is more important than ever. Craig Shrives and Paul Easter can teach you how to stand out from the crowd. Writing and Grammar. No one cares what you've got to say unless it affects or entertains them. Learn how to write for maximum effect. Biases. Our experiences influence how we view the world and make decisions. Improve your understanding of these biases and form strategies to get your own way and defend yourself against those trying to get one over on you. Body Language. People's body movements can contradict or confirm what they are saying. Becoming more aware of what is going on around you will help you read people better and give you an edge in dealing with them. Statistics. We all need to be less trusting of the statistics presented by peddlers, politicians and the press. Develop a critical eye to spot when statistics are being manipulated. Buying and Selling. Learn strategies to win yourself a bargain. A suspicious eye in the supermarket can reduce your weekly shopping bill by 10 per cent. How To Get Your Own Way uses easy-to-follow, real-life examples and layman's language to give you the tools to defend yourself from manipulation and to influence other people's actions or challenge their claims.